At some point in your life, cost you may have kept a diary, capsule pouring into it all of your deepest and darkest thoughts; the ones that you felt were too embarrassing or inappropriate to say aloud. 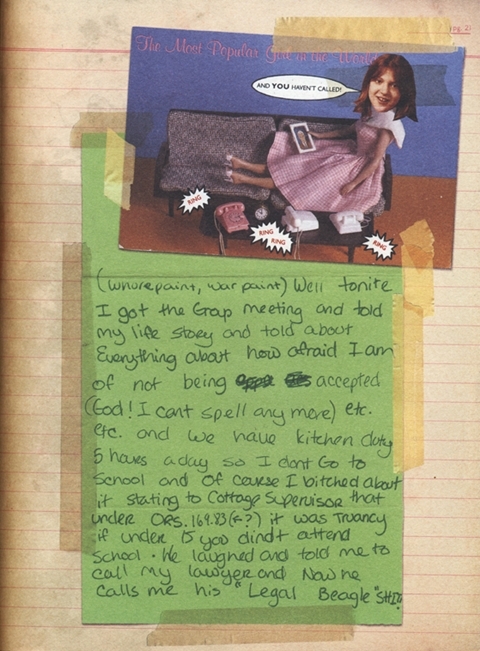 My experience of reading old diaries is always toe-curling, but amusing as I struggle to make sense of why I cared so much about some things to write about them (for example, “loaf of bread head guy” who I adored from afar featured regularly in my diaries for a while – don’t ask!). As much as I would like to say that my diary entries were highly interesting, intelligent, deep and profound, most of them are sleep-inducing and consist of a type of written diarrhea. Thankfully, this is not the case at Cltr.Alt.Shift’s new exhibition, “Dear Diary”. “Dear Diary” is a new project launched by the youth anti-poverty charity to explore the art of diary keeping, taking participants on an inspirational and reflective journey, through the private pages of young individuals across the globe. The exhibition is housed under a funky t-shirt shop in Covent Garden in an intimate space, bringing together several diary collections ranging from Nirvana frontman and lyricist Kurt Cobain, to the stunning visual diaries of Dan Eldon, a young and promising photojournalist who was killed on the front line by an angry mob in Mogadishu, aged only 22. The room is divided into seven exhibits where on entry, you are confronted by four portraits of Eldon’s work, each infused with vivid, bold colours; a stark contrast to the bare white walls. The first image I encountered was the profile of a young, elegant looking tribeswoman wearing an intricate-looking traditional headdress, set against a backdrop of vibrant oranges and pinks. What I found most intriguing about this visual is that it had been signed with “Love and kisses, Angela” and “Love Maria”, and I was curious to know who these woman were. Had they been part of Eldon’s life at some stage and if so, how would their own diaries have read after his death? Another one of Eldon’s portraits which had a gripping effect on me was that of four faded pictures in what appears to be a group of friends on a camping trip, smiling and chatting happily amongst each other, mounted on a map of Tanzania’s national parks. On closer viewing, the outlines of what appears to be three people – sketched with thick graphite pencil onto grainy beige/orange-coloured paper – are superimposed onto each of the original photos, as if they are joining the group but are separated through their apparent difference in physicality. A sentence is scrawled across the bottom of the map reading: “Dedicated to all 3 who lost their lives during the dramatic escape from Mikumi Nat Park”, providing us with a glimpse of the harsh reality of civil warfare, to which Eldon perished. I was deeply moved by some of the diary excerpts displayed on the diary wall, written by teenage Kenyans living in extreme poverty and political instability. Although many of the entries were simplistic and occasionally poorly structured, the diarists’ basic descriptions painted a vivid and poignant image of the future that they longed for: “It’s also my hope in future this kind of thing will never happen again coz it also took death to many of my friends and also the separation of my beau and since then we have never communicated which made me so lonely”. Other diary entries detail the violence around elections and the hardship that economic deprivation brings: “…Our family made up of 11, it was hard to grow up due to poverty. It was hard and difficult to study”. Aware that I am painting quite a grim and depressing picture of the exhibition, I assure you that this exhibition is not just a collection of doom and gloom. The audio diaries present a more eclectic mix of personal accounts, ranging from the inspirational to hilarious. Of these, the most compelling piece was of a courageous 19 year old South African girl called Thembi who broke the silence about living with AIDS at a time when it was still a taboo subject in South Africa; she eventually went on to share her story with more than 50 million people. A highly amusing reading from comedian Richard Herring about his painful years as a chubby brainiac, who at the time believed he would be a virgin forever, also makes for an entertaining listen. In a far corner of the show room, there is an area for quiet reflection with an extremely comfortable chair which I made my home for a good part of the evening, taking advantage of the diary library, which included entries belonging to Samuel Pepys, Frida Kahlo, Kurt Cobain, Courtney Love and several volumes of Anaïs Nin’s journals. On the top shelf (no, not what you are thinking), there were two books available for documenting your own thoughts, which people had written in throughout the course of the evening, with one refined gentleman expressing that he was looking forward to going home and banging his wife! Nice. Other exhibition highlights include the unpublished diaries of ordinary people from the 19th century displayed in a glass case, collected by the British Library’s Irving Finkel over the years. Finkel would often search for these items at secondhand shops and house clearances, believing that they hold the key to our histories through the casual documentation of one’s environment at the time. The child in me gravitated towards the Children’s Pocket Annual and Birthday Book of an eight year old girl and scouts’ diaries with stained pages and frayed edges, detailing the mundane routines of school work, bath days and playing with wolf cubs (well maybe playing with wolf cubs wouldn’t have been so mundane). Ctrl.Alt.Shift’s “Dear Diary” is an intelligent and thought-provoking initiative, which takes a concept that we are all familiar with to help us understand and relate with others. Through encountering a range of diaries, including that of Mexican artist Frida Kahlo, a boy living with Tourette’s in the US and teenagers living in the slums in Kenya, our attention converges on the fact that whatever our language and ethnicity, the expression of thought transcends cultural boundaries. Although we may be divided geographically and by our heritage, fundamentally the feelings that we experience are the same. As part of the project, Ctrl.Alt.Shift have also launched a limited edition diary, with a cover illustrated by Alexa Chung featuring extracts from Courtney Love, Daniel Johnson and Anaïs Nin, which you can buy here. All proceeds raised from the ‘Dear Diary’ project go towards Maji Na Ufanisi, working with young people from the slums of Nairobi. For more information about location and opening times, check out our listings here.